EastComfort offers long term rental apartments in Bucharest. So if you need to arrange corporate housing, book a holiday apartment or long-term accommodation for a business project in Bucarest you have come to the right place. 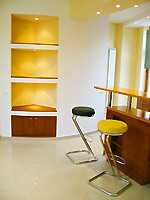 Rent now an apartment in Bucharest and get excelent rates! Your staff deserves to sleep well! Call us in order to get an offer for selected month ! Luxury long term apartament rental, detached, brick building in the Armeneasca neighborhood of Bucharest. The apartment covers 110 mp and is situated at the third floor in a 3 level building. It is made up of 3 rooms, 2 bathrooms and 2 balconies. Completely renewed and equipped with modern architectural finishings, brand new furniture in all the rooms kitchen and bathroom, this flat is the first option for those clients who appreciate high quality. In a word this apartament is the best alternative to hotels. The pictures speaks more than words but the reality is definitely more than words and pictures. Well appointed downtown this apartment has the perfect location, because ensures relaxing accommodation in a quiet area and has easy access toward all points of interest. There are plenty clubs, bars (Cafe Lorencz), stores and restaurants (Korea House Restaurant and La Casa Restaurant). Also near by you can visit The Teoder Pallady Museum.